Registration for Primary, Beginner & Novice dancers will begin at 8:00 A.M. and end at 8:45 A.M. The competition will start at 9:00 A.M. with the Beginner and Novice Lilt, followed by Primary Pas de Basques. Registration for all Choreography competitions will being at 11:00 A.M. and end at 11:20 A.M. with the choreography competition starting at the conclusion of the morning awards (approximately 11:30 A.M.). Choreography max of 1:30. Please email music to QOSDA@hotmail.com by November 11th. 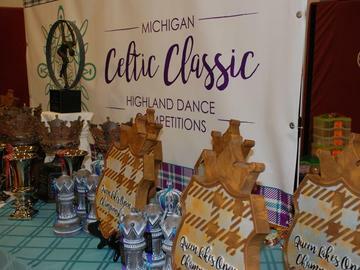 Intermediate & Premier registration will begin at 12:30 P.M. and end at 12:50 A.M. with the afternoon competition starting at the conclusion of the choreography awards (approximately 1:00 P.M.) with the Intermediate Hornpipe. Dances will be competed in order listed. Doors to competition venue will open at 8:00 A.M. Host Hotel: Hampton Inn-Detroit/Shelby Township, 51620 Shelby Parkway, Shelby Township, MI 48315, Phone: 586.731.4267. Group rate of $99/night available under group code "Celtic Classic" until October 19, 2016.